Vacations already cost an arm and a leg, so not many people have an extra few hundred dollars laying around to spend on tours, activities and adventures. If you are visiting Curacao, here are some free activities which will keep you occupied and entertained during your stay. Pack a picnic lunch and head to the beach for the day. Most of the beaches in Curacao are open to the public for their enjoyment, free of charge. Spend the day in the sun, swimming, snorkeling or diving. Be sure to bring your own blanket, snacks and beverages for a completely free day. Don’t let the name scare you off. If you are more of an adventurous traveler, take a short hike to Blue Room Cave and reward yourself with a dip in the crystal blue waters. If you are hesitant to swim on your own, kayaking, snorkeling and diving tours are available, for a fee. Curacao is a popular island for cruise ships. The port is an active, vibrant place and always has ships coming and going. Relax port side and watch the ships come and go and take in an endless amount of people watching. Visit the Rif Fort Village which is a refurbished fort located right on the waterfront. Sit back, relax and enjoy the sounds of the Caribbean music ringing through the air. This is also prime real estate for people watching. If you feel the urge to splurge, this area is home to many bars and restaurants. If you have had enough of the people watching in the Rif Fort Village, continue on and you will immediately come to the Queen Emma Bridge. This pontoon bridge spans the St. Anna Bay connecting the two sides of the capital city of Willemstad, and will swing open to allow the ships to come and go. Locally this bridge is referred to as the “Swinging Old Lady”. When the bridge is open, two ferries come to life to transport pedestrians from one side to the other, free of charge. This is also a fantastic spot to watch the ships and to people watch. 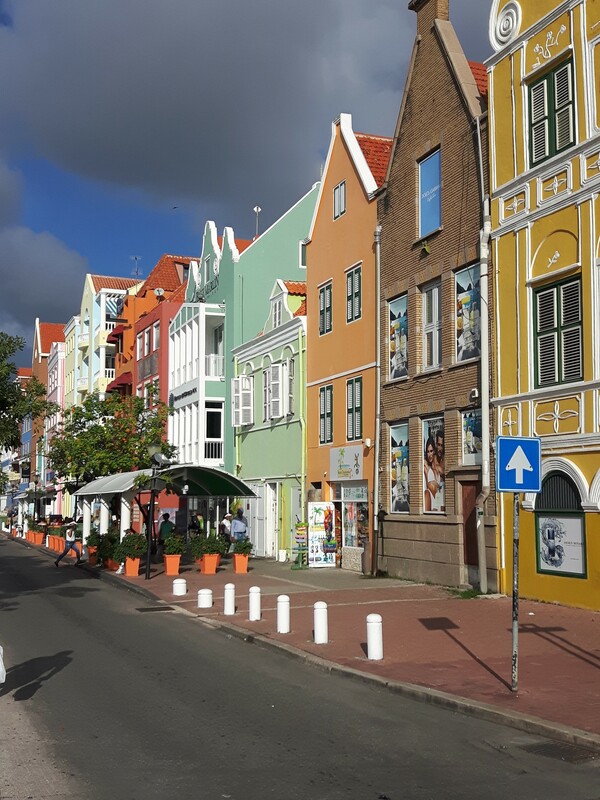 My favorite part of the entire island, and it doesn’t have to cost you a cent to wander the streets of Willemstad and admire all of the candy colored buildings. This is the best spot on the island for window shopping, and is a must do freebie while in Curacao. The only caveat is that the many restaurants and local pubs can be enticing, so if you think that you might have limited will-power, be sure to have some money on hand. If you have rented a car or have other means of transportation, pack a picnic and explore the diverse topography of the island. You will find sandy beaches with the calm water of the Caribbean, as well as rocky shorelines and choppy waters which is where you will find people surfing and kiting. The aloe vera plant is one of the few plants that is able to grow in Curacao. If you are interested in the benefits of the “home grown” aloe plant, then this is a place you just visit. You will be able to observe the large aloe vera fields, as well as receive a brief history about the plant, free of charge. There is a small store on site which sells skin care products, bath and shower products, and even aloe beverages which benefit your health and well-being. If you are interested in learning what a chichi is to the Curacao people, then a visit to Serena’s Art Factory is in order. It is quite interesting and you will learn the meaning of chichi, and if you are lucky, you will witness an artist at work creating a one of a kind chichi. this is a free activity, however, if you wish to arrange to join a workshop, a reservation must be made. There is a fee if you choose to do this activity. I always like to save the best for last! To learn about and taste test Curacao’s native drink, the Blue Curacao, a visit to Curacao’s Liqueur Distillery must be put on your list. Take a self-guided tour and learn everything there is to know about the making of Blue Curacao. Once you complete the tour, be sure to indulge in the free taste test. Guided tours are available for a fee, if you would like to do a more in-depth activity. If you want to indulge in a little more than what the taste test provides, you will need some cash, as there are various types of drinks available, while you lounge in the beautiful outside courtyard. So my friends, as you can see there is lots of free activities on this beautiful island and this vacation doesn’t have to break the bank. If money is no object, there certainly are many more activities and adventures which you can participate in. Great list I always try to do free things when travelling. It saves cash but also locals tend to more free things and it’s a good way to meet locals.